Just Sold! Enjoying the melodic tinkling of the aspen leaves rustling in the breeze, the trickling sounds of the babbling brook at our backs, and the beauty of fall ablaze with color, I felt invigorated as I began painting this aspen forest. The setting was so peaceful and rejuvenating that I wanted to communicate that joyful feeling of discovery. 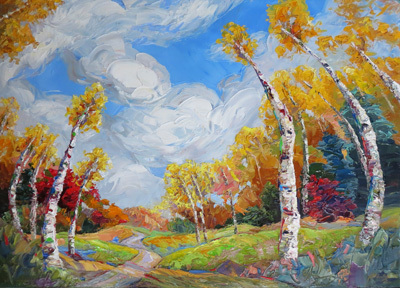 Filling the canvas with energetic staccato strokes and bold colors, in addition to gently arching the tree trunks reaching towards the sky, add to that uplifting feeling. And then just a sliver of the trail cutting through the forest, suggests the excitement of the journey that is to come. To see more of my contemporary landscape paintings online, visit NikiGulley.com. E-mail Niki Gulley for more information.